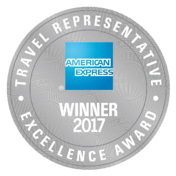 For the 19th consecutive year, Travelink is honored to announce we were named one of American Express Travel's Representative Excellence Award Winners. The Representative Excellence program was established to recognize the top 25 performing agencies in the Network who have most significantly contributed to its success. These recognized agencies have demonstrated concentrated efforts against Preferred Supplier goals, engagement with American Express products and programs, and a continued commitment to representing the pillars of the American Express brand.